Vannessa Dorantes, the commissioner-designate of DCF. Vannessa Dorantes joined the Department of Children and Families nearly 27 years ago, one of the scores of social workers hired to bolster an understaffed DCF at the insistence of a federal court monitor. On Monday, she was nominated to lead that agency, which remains under the consent order that led to her hiring in 1992. 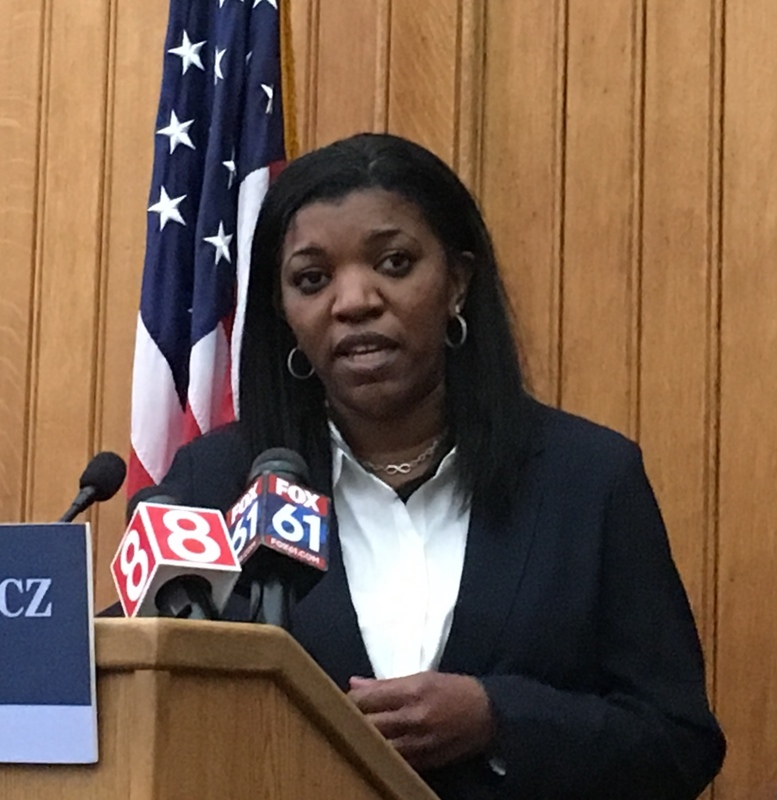 Gov.-elect Ned Lamont said he ended a national search for the next DCF commissioner and chose Dorantes at the urging of former Supreme Court Chief Justice Chase T. Rogers, a transition team member who had interviewed Dorantes and other stakeholders in search of policy ideas for the child-welfare agency. Dorantes, 50, a regional administer who oversees three offices and 500 employees in 44 communities ranging from Danbury to Waterbury to the Litchfield hills, would be the first African-American leader of an agency that employs 3,200 and handles 108,000 calls reporting neglect and seeking assistance every year. Dorantes, who has a bachelor’s degree from Teikyo Post University and a master’s degree in social work from the University of Connecticut, also is an adjunct professor at Central Connecticut State University, where she has taught social work for 14 years. 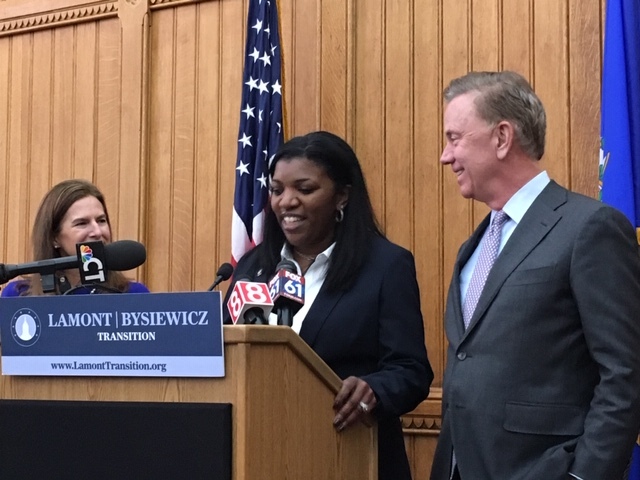 Vannessa Dorantes, flanked by Lt. Gov-elect Susan Bysiewicz and Gov.-elect Ned Lamont. When he takes office on Wednesday, Lamont will become the sixth governor to hold office since children’s rights advocates sued the state over DCF’s shortfalls in 1989 during the administration of William A. O’Neill, and the fifth since Lowell P. Weicker Jr. agreed in 1991 to a consent decree placing the agency under federal supervision. Having seen past administrations come and go without escaping court oversight, Dorantes declined to set a timetable for its end, promising only to continue the progress that has greatly narrowed the court’s areas of concern. “I’m strongly committed. We can get over the line,” she said. Dorantes, who is the commissioner-designate until confirmed by the General Assembly, would succeed Joette Katz, a former Supreme Court justice who was the DCF commissioner for Gov. Dannel P. Malloy’s eight years in office. Katz, one of the nation’s longest-serving child-welfare commissioners, did not seek reappointment. Lamont promised Dorantes similar support. The agency hired 120 social workers last year to lower caseloads. Dorantes said Monday her goal is to stabilize that workforce by decreasing staff turnover. Mancuso said the state had met its goals of decreasing the number of children in group facilities and institutions, placing more children with siblings, limiting the number of moves for children in foster care and ensuring that children are placed in homes operating within their licensed capacity. In 2011, DCF housed about 25 percent of the 4,900 children in foster care in such placements. A recent outside assessment found the number now is less than 10 percent, with only 17 children age 12 and under in non-family placements and 89 children in intensive residential institutional placements. Dorantes said the approach of minimizing institutional care for children is the right one, even if it carries risk. Asked if the right balance has been achieved, Dorantes replied, “I think we’re headed there. We reduced the reliance on congregate care to under 10 percent. Rep. Jahana Hayes was critical of Education Secretary Betsy DeVos's refusal to oppose the use of federal money on firearms for schools.